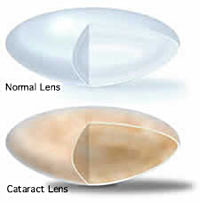 A cataract is a cloudy or opaque area in the normally transparent lens of the eye. As the cloudiness worsens, it prevents light rays from passing through the lens and focusing on the retina, the light sensitive tissue lining the back of the eye. The lens is located behind the iris, the colored portion of the eye, and the pupil, the dark center of the colored iris. Behind the iris are tiny ligaments, called zonules, support the lens within the eye. The lens has three parts: the capsule, the nucleus, and the cortex. The outer membrane, or capsule, surrounds the cortex, which in turn surrounds the center or nucleus of the lens. If you imagine the lens as an egg, the capsule is the shell, the cortex is the egg white, and the nucleus is the yoke. Usually, the center part called the nucleus becomes clouded first. Researchers, looking for preventive measures, are gradually identifying factors that may initiate or facilitate the development of cataracts. Recent studies show people living in high altitudes or those who spend a lot of time in the sun develop cataracts earlier than others. Dr. Brems recommends wearing sunglasses and a wide-brimmed hat to lessen the eyes exposure to UV light. Other studies suggest that people with diabetes are at risk for cataracts, as are users of steroids.